Future historians might well consider that this current period is a turning point in Australian strategic history. the economic benefits of the Free Trade Agreement. The big strategic question for Australia is how to negotiate the tension between our key security partner and our key trading partner. We’ve never had this question arise in the first 220 years of European settlement. From January 1788, when the First Fleet sailed into Botany Bay, to 2008, during the Global Financial Crisis, we’ve had first Britain and then the USA as our trading partner and strategic ally. But now China is our largest two-way trading partner in goods and services (valued at $150.0 billion in 2015–16), our largest export market ($85.9 billion) and our largest source of imports ($64.1 billion). This is something that really cries out for attention by all members of the Australian Parliament. What happens—or does not happen—is of the highest significance to Australia. The signals we send to either side about Australia’s position requires extensive consideration in the Australian Parliament. Australia would not be spared from disruption to our economy and demography. RAND said a US-China war could shrink China’s GDP by 25–35% and the USA’s by 5–10%. But given our much higher trade dependence on China—four times more reliant as a proportion of GDP than the US—a 30% contraction would not be out of the question. And demographically? Seeing Chinese Australians and Chinese students on our streets shows how integral they’ve become to our nation’s fabric. A war with China would rip Australia’s economic and social fabric apart. I don’t think any Australian participation in the South China Sea ought to occur until every member of the Australian Parliament has had a chance to vote on it, and has been put on the spot to explain their reasons individually—not hide behind the line of their respective party. I believe that parliamentary authorisation is workable and can be formulated in a suitably flexible way that takes a variety of contingencies into account, protects the security of classified information, and copes with the time-sensitive nature of emergency military deployments. In requiring Parliamentary approval, it is necessary to distinguish between ‘wars of choice’ and ‘wars of necessity’. Wars of necessity refer to military actions taken in self-defence and require the use of rapid and/or covert military force. At the moment, the danger is one of a surprise war, as a result of an escalation during (say) a freedom of navigation exercise, in which Australia’s Executive deploys forces without any effective check from the legislature, since the only option parliament has is to bring down the government through a motion of no-confidence—something that backbenchers in a governing political party can hardly be expected to do, whatever their misgivings about a particular military deployment. Furthermore, using the line and military strategy attributed to Sun Tzu, China may decide to ‘kill the chicken to scare the monkey’—sink an Australian vessel to warn off the United States Navy. The signals we send to either side about Australia’s position are of the highest economic and strategic significance. What we do requires extensive consideration in the Australian Parliament. Whilst this debate has been both energised and exercise by the Trump Presidency, it’s worth remembering it was no less than the husband of Candidate Trump’s rival who said, while he was in office, ‘We will act multilaterally where we can, unilaterally when we must’. Australia alone should decide which wars we go to, and the circumstances in which we go to them. That goes to the heart of our sovereignty. Australia must not get involved in a South China Sea conflict until every member of the Australian Parliament has voted on it, and explained their reasons individually—not hide behind a party line. What’s more, that process should be enshrined in Australian legislation; no Australian military actions ought to occur without parliamentary authorization, except in self-defence. More than ever, since 1788, it’s a law whose time has come. 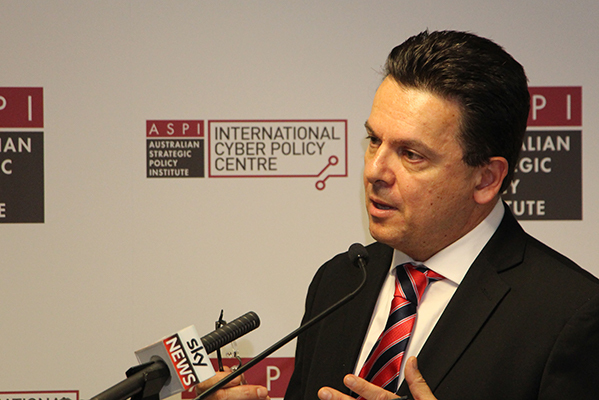 Nick Xenophon is an Australian senator for South Australia and the leader of the Nick Xenophon Team. This is an edited extract of his address to the Australian Strategic Policy Institute on 20 April 2017. Image (c) ASPI 2017.